Unsticking a zipper: Ever gone to take off your boots, only to discover that the zipper is stuck? Free yourself by dabbing a bit of olive oil onto the zipper’s teeth to help it slide along smoothly. Remember: a little oil goes a long way. Revitalize wood furniture: Whip up a mixture that’s 2 parts olive oil to 1 part lemon juice. Put a small amount of oil on a soft cloth, and wipe down your wood furniture. It will keep the wood from drying out and help hide small nicks and scratches. •	Put the vinegar in the microwave for 1 minute. •	Add the Dawn soap to the spray bottle. •	Add the hot vinegar to the spray bottle too. •	Close the lid tightly, and lightly shake it to get it all mixed together. •	Note: Don’t use too much of the solution, or you will be wiping it off of your floors for days! Remember, a little goes a looooong way here! 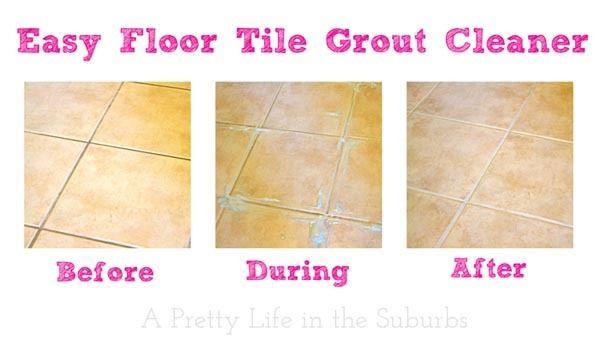 •	Lightly spray the solution onto your grout (you don’t need to cover the tiles, just get it in the grout). •	Let it sit for a few minutes. •	Using a brush of some kind (I use an old toothbrush), give it a scrub. You won’t have to scrub too hard or for very long, because this cleaning solution just lifts up all the dirt – it’s amazing! •	Wipe off the cleaning solution with a wet cloth, then wash your floors well with plain hot water to get rid of any soap residue. •	Like I mentioned before, don’t use too much of this solution!! Or your floors will have a soapy residue left on them! •	I realize that this method likely isn’t practical for large tiled areas! I use it in my bathroom and mud room, so the size of the rooms are manageable. •	You can use this solution in your shower or tub too! Just spray it on, let it sit for a few minutes, then scrub off. It’s the best. I always have a bottle made up and ready to go. Also, please note: you DO NOT need to heat the mixture every time you use it. Just when you are making your original batch – this is just to make sure that the soap and the vinegar mix together thoroughly!